The current controversy over the name “Redskins” and the reputation of team owner Dan Snyder seem to be a natural legacy of the team founder and owner George Preston Marshall. 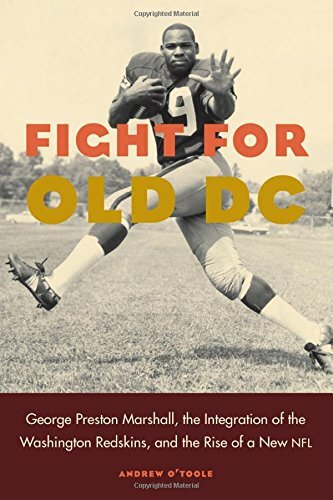 In Fight for Old DC, Andrew O’Toole provides a history of the team and a portrait of Marshall. The focal points are Marshall’s resistance to desegregation and his outsized ego, the leading role that Marshall played in the early NFL ownership group, and the emergence of the post-World War II National Football League as the sports favorite of millions of American sports fans. Andrew O’Toole is the author of six books on American sports including two biographies of significant and powerful NFL figures, Paul Brown and Art Rooney. He brings this knowledge and considerable insight to this story of sports, politics, and race. A journalistic writing style makes this significant piece of NFL history accessible to football fans and serious students of sports alike. George Preston Marshall made his money in the laundry business and became part owner of the NFL Boston Braves in 1932. He renamed the team the “Redskins” to distinguish it from the baseball Boston Braves. In 1937 he moved the team to Washington because it was drowning in red ink. Marshall was one of a new generation of owners who had a keen understanding that professional sports was part of the entertainment business. He was above all a showman and created a team marching band, cheerleaders, a team song, and saw the potential of television. In this sense he was a leader in the creation of the NFL as we know it. As a person, he had strong loyalty to friends. He believed in himself and his own judgement above all others and centered his life on his football team. He viewed himself as a southerner and saw his team as the representative southern team in the NFL. His radio and television contract networks blanketed the south from Washington to New Orleans while his views on race coincided with that of the white south. By the late 1950s and early 1960s, the civil rights movement was gaining momentum. The Redskins were the last major professional sports team to remain segregated, and pressure mounted on Marshall to hire African American players. He staunchly refused to do so and insisted that he had a right to hire or not hire anyone. He insisted that he was progressive on race, pointing out all of the African Americans who worked at the stadium. Ultimately, time and political pressure overcame Marshall in the form of Secretary of the Interior Steward Udall, a cabinet member in the Kennedy Administration. With the new Washington Stadium under the jurisdiction of the Department of the Interior, Udall was essentially the Redskins landlord. O’Toole relates the ins and outs of this story very well, although in the end, it is not entirely clear how much of the pressure on Marshall came from the president and how much Secretary Udall acted on his own. The details of the process that ultimately led to the first African Americans playing for the Redskins are quite interesting. O’Toole is adept at explaining the twists and turns of that process, and particularly the contortions of denial performed by George Preston Marshall convincing himself that no one had forced him to desegregate his team. Another thread woven through the book is the story of the emergence of the “new” NFL. O’Toole certainly provides a competent survey of this development, but he might be criticized for giving too much credit to NFL Commissioner Pete Rozelle. O’Toole offers a largely uncritical analysis of the rise of the league under the leadership of the genius Commissioner. Stories of success too easily become “triumphal history,” and the rise of the NFL to the position of National Pastime fits this pattern. George Preston Marshall comes off the pages of Fight for Old DC as a complex figure. At some points it is easy to see him as a national boor, while at other points he is clearly a significant figure in the development of the NFL. As a person he has a certain charm, but that charm is often overwhelmed by the enormous ego that fueled his public and private behavior.